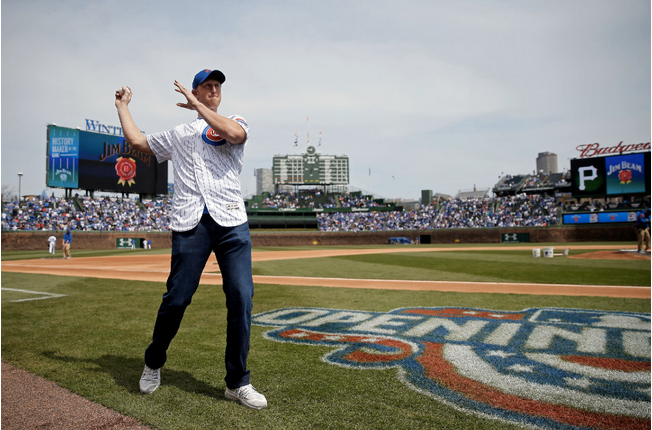 For the fans who were at yesterday’s Cubs and Pirates game at Wrigley Field and decided to boo your new Bears’ starting quarterback, Mike Glennon, you should be ashamed. I understand the majority of fans are not excited about the move, including myself, but to boo the man you will inevitably be cheering for once he throws his first touchdown is contradictory. The verbal displeasure with Glennon isn’t going to change who is under center at the start of the season. When it’s third down and eight and the Bears need to convert to sustain the drive, you’re going to hope that he throws a perfect pass with a defender draped all over his receiver to keep his offense on the field. For eight years Bears fans have watched Jay Cutler try to do just that, and at times he was the reason for some amazing wins but at the same time some agonizing losses. This offseason general manager Ryan Pace had to make the decision to part ways with the polarizing quarterback. The drawback to that decision was there weren’t many options to replace Cutler. Arguably, the two best solutions to address the position was either trading for New England Patriots backup Jimmy Garoppolo or paying a large chunk of money for an injury prone Tony Romo. Instead, Pace went with Glennon. A young quarterback who is looking for an opportunity to show what he can do. He didn’t have a talented group of playmakers during his rookie year in Tampa Bay but still showed some positives. Now, he is in Chicago. There are some young talented playmakers, like Cameron Meredith, Jordan Howard and even Kevin White, who are looking for opportunities to showcase their abilities. Just like Glennon. This season is a fresh start for every player wearing the orange and navy blue. Glennon, signed a three-year $45 million-dollar deal, with $18.5 million guaranteed and $14 million is due to him after this first season. His contract says the Bears aren’t fully committed to him and I believe that is accurate. Think of Glennon as the guy who will help with the transition from the Cutler era to the eventual franchise quarterback. With the draft 12 days away the Bears may look to address the situation. Whether that is with the No. 3 overall pick or one of the later ones, Glennon allows for that rookie quarterback to be worry free of starting in Year 1. But until the Bears find that guy, he will be the one who touches the ball every play. And he is excited about that opportunity. He was interviewed at yesterday’s Cubs game and said he is looking forward to starting the offseason program, which begins next Tuesday. Glennon has worked out with Meredith and newly acquired wide receiver Markus Wheaton at Deerfield High School, where they have started to build chemistry by running basic routes. I know Chicago has passionate fans and loves to see their teams win, especially the Bears. Until the season begins and we have seen what Glennon can or can’t do, hold the boos. We have been booing plenty over these past six seasons. I think fans have a right to boo. They aren’t happy with the decision to sign Glennon and make him the starting QB. I’d rather draft a QB and let him go through growing pains. Bears aren’t going to be good anyway. I get it the fans aren’t happy, but why show your displeasure? Ryan Pace didn’t have much options to address the position in the offseason. Also, the Bears most likely will draft a quarterback and I like that at least Glennon is in Chicago for at least a season to let that rookie develop. I’m not saying the Bears will be good with Glennon, they just needed to end their relationship with Cutler and show the fans it’s time to move on. IN 2016, DA BEARS WENT INTO THE SEASON WITH ONE OF THE YOUNGEST SECONDARY IN THE NFL. FOR MOST PART IT SHOWED. NOT ONLY THAT DA BEARS HAD MORE THAN 3 POTENTIAL NFL STARTERS BATTLING INJURIES IN THE SECONDARY. ​​​​​​​DA BEARS PLAYED PRACTICE SQUAD TALENT PLAYERS IN THE SECONDARY LAST SEASON DUE TO INJURY. WITH THAT SAID DA BEARS WHERE STILL IN GOOD POSITION TO WIN GAMES IN THE FOURTH QUARTER. THAT BRINGS US TO THE QUARTERBACK PLAY. WHICH ALSO SUFFERED SOME INJURIES.